While recuperating, dealing with laceweight yarn was just not on the agenda. So I pulled out some of the Bendigo Woollen Mills Luxury that I got for Christmas last year. 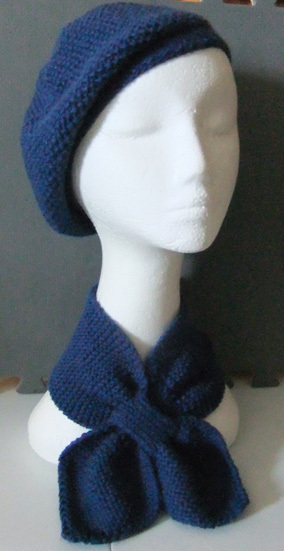 Some of it was earmarked for a hat, so I decided that a little beret would be perfect. And given all the cold weather we’ve been having, and because I have really short hair now, my neck is exposed and requires something toasty around it. So I did a search through Ravelry, and found two cute and quick little knits. Bubble Hat is cute, top down hat, with enough interest in the seed stitch that it wasn’t a boring knit. I wanted something floppy, but I ended up making it HUGE. So I had to rip back about 2.5″ and reknit the band. I eliminated the button bits, but I am considering a little bow for it. The Bow Knot Scarf looked like a very quick little knit, and indeed only took me 2 days. Loads of garter stitch and a tiny little bit of ribbing, and while the pattern calls for a Worsted/10ply yarn, I found the Luxury more than lofty enough to make it big enough for me, and nice and toasty. The two knits took less than a ball of yarn and about 2 weeks all up, with my somewhat limited crafting time. I’m sure someone who wasn’t recovering from surgery, or doesn’t get distracted by the “shiny” as easily as I do, could knock them over in a week. It was good to get something that I can wear done in time for winter. I love that they’re a little vintage looking, too. I’ve worn them quite a bit already and they are LOVELY to wear!